COLUMBUS – One practice was in the books and J.T. Barrett was ready for more. “It was time to get going,” Ohio State’s senior quarterback said after the Buckeyes finished their first practice for the 2017 football season on Thursday. That could be a theme for the rest of fall camp and the rest of the season for Barrett and the Buckeyes’ offense. Even though Ohio State was second in the Big Ten in scoring (39.4 points a game), just behind Michigan and two points a game ahead of Penn State last season, the Buckeyes’ offense seemed to have trouble getting going at times. 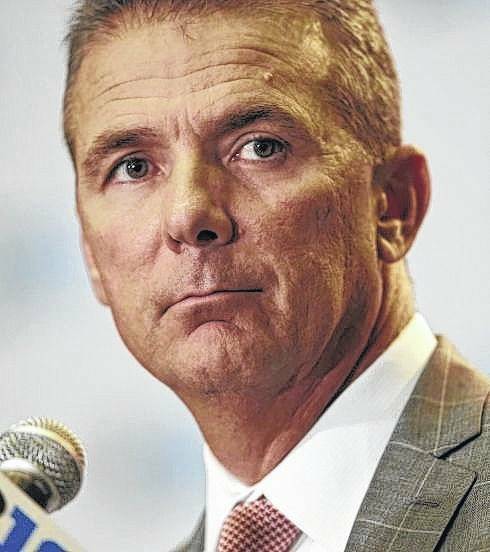 That was never more evident or more painful for Buckeyes fans to watch than when Clemson shut out OSU 31-0 in a semifinal of the College Football Playoff on New Year’s Eve in the first shutout ever against an Urban Meyer coached team. Change came quickly, at least in the coaching staff. Quarterbacks coach Tim Beck left to join Tom Herman’s staff at Texas four days after the loss to Clemson and Ed Warinner was on his way to Minnesota, where he is the offensive line coach, less than two weeks after that loss. Former Indiana head coach Kevin Wilson, known as an offensive guru as an assistant at Northwestern and Oklahoma, and as the Hoosiers head coach was brought in as offensive coordinator. Former San Francisco 49ers assistant Ryan Day was hired as quarterbacks coach. In many fans’ minds, their primary job is to fix Barrett, who has not been quite as productive the last two seasons as he was as a redshirt freshman in 2014 when Herman was Ohio State’s offensive coordinator. But Wilson said his job isn’t to overhaul Barrett, it’s mostly to find the best match between his skills and the play calling. “He’s very mature. He wants to get better. He is a very, very talented kid. I don’t know if we’re going to make him a better passer but we are going to put him in good situations,” Wilson said. “We’ll need to throw the ball well and run it well. To me, balance isn’t necessarily 50-50. When team make you throw it, you have to take advantage of those opportunities. And you have to be able to run it. “It’s like playing basketball. You have to go to the left, you have to go to the right and use both hands,” Wilson said. In 2014, Barrett went from an unknown back-up to a Heisman Trophy candidate when he passed for 2,834 yards and 34 touchdowns and rushed for 938 yards and 11 more TDs before his season was ended by a broken ankle in the Michigan game. He and Cardale Jones shared the starting job in 2015 and last year he was the first-team All-Big Ten quarterback when he threw for 2,555 yards and rushed for 845 yards more. Meyer defended Barrett’s performance last year at the Big Ten Football Media Days earlier this week, saying that OSU’s receivers, tight ends and offensive linemen did not play up to expectations. In the two years since Herman left, Ohio State has gotten away from the “tempo” offense he used in which the Buckeyes played fast and got to the line of scrimmage for their next play fast. Some of that could be coming back this season, Barrett said. “One of the main things is our tempo. I think at times we got away from that. That’s a part of who we are,” he said. “Coach Wilson and Coach Day, they’re going to enhance that and we’re going to make sure that stays consistent. “We’re a run team first. We want to make sure our running game is going. As far as more passing attempts, we are going to try to do more stretching the field horizontally,” he said. “Now we’re really starting to get it going and get a feel for each other,” he said.